My role in our campaign is the guy who dies a lot. Not that I actually die a lot, but my characters die more often by far than the next guy along. There are three adult and three minor-age players in the game and the DM makes a point of focusing the stories on the kids. I think that’s a good idea. About the deaths, I’m cool with it. It’s like playing the special guest star. It’s good to try out different classes and different personalities and ways to approach situations. I can teach the newbies different tactics and strategies that way. When I was handed the kernel of an idea for my latest guy, we knew he was a cleric and they found him digging latrines for a refugee camp. He was the toilet cleric. So what do you do with a toilet cleric? It’s been established in this campaign world that at least some of the gods are the Norse gods. Whether you’re dwarf or man or elf, you might have allegiance to one or another of the Norse gods. So which Norse god would be the god of latrines? 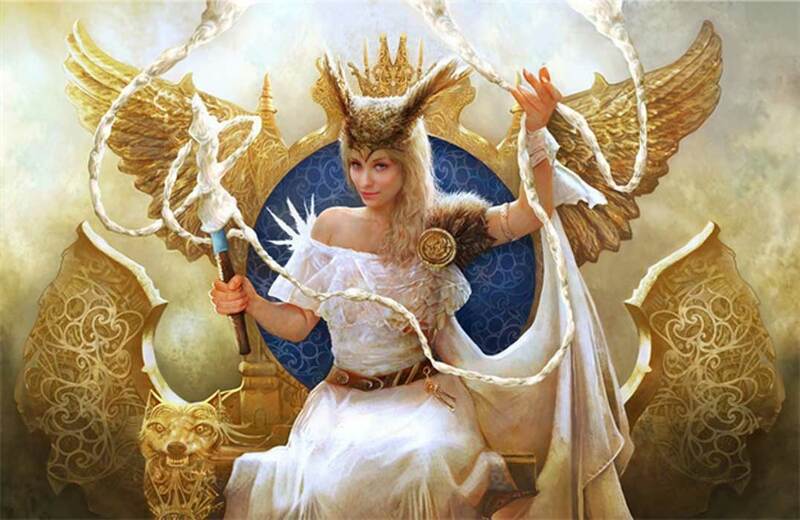 I looked over several lists of gods, demigods and giants and it seemed most likely that my cleric venerates Frigga. She is the wife of Odin and the goddess of hearth and home. (Norse gods are not worshiped like Christians might worship, but rather venerated and paid homage to in a more purely-ritualistic way.) And I have played with this cleric to Frigga for several sessions now. He is Lawful Neutral. He is into control and orderliness. His favorite spell is Hold Person, because it negates some enemies without having to fight. Additionally, once a person is held, it’s possible to negotiate from a position of greater strength. So I’ve done a lot of thinking about this cleric and his theology. There is no real theology to speak of in Norse history. They have a cosmogony – a story of the beginning, middle and end of the gods – and possible rebirth, along with a structure for Existence. But there’s not a lot of theory to go along with it. I feel comfortable inventing my own. My cleric’s name is Robert Bluetooth, named after Harald Bluetooth Gormsson, who was the king of Norway and Denmark in the 10th century. “Bluetooth” in this case refers to his clean white teeth that look bluish. When already a middle-aged man nearing the sunset of military age, Bluetooth was on a walk in the woods collecting pine cones. There he encountered a lesser outsider – we would call it a hound archon. The outsider charged Bluetooth to go on a pilgrimage to the mountains and to meet with Frigga herself in her winter palace. Bluetooth was moved by this encounter with the otherworldly but initially refused. So he was visited by a lantern archon, a more powerful outsider. Only then did he begin the trek up the mountain. It took nearly a month. He climbed from one village to the next. Scathi, the giantess who controls the snow, played tricks on him most of the way, but he persevered. Three days’ climb out from the very last village, he finally came upon Frigga’s winter palace. Lacking any evidence that he was expected, he parleyed with the giant at the gate and was eventually allowed in. Within, he was received by Frigga. She was twenty feet tall and gloriously beautiful. Upon a great feast of ambrosia and mead, she explained to him that Surtur was coming for the people of the realm and that he was bringing the dark elf armies to plague the lands. It was important for men to put aside their material concerns in the face of the coming conflict. “I didn’t know that,” said Bluetooth. “Believe me, you were not my first choice. And you won’t be my last,” she said cryptically. “I have always made appropriate offerings to you and the other gods. This you know,” he said with some indignance extant. And Bluetooth well agreed, and Frigga made him up into her champion – a cleric given over to the goddess. Frigga is above all things a Lawful goddess. To master Frigga’s faith is to master one’s mind. This means always telling the truth, no matter how it hurts you to do it. It means to keep yourself from strong emotions to the best of your ability, and to never act from rage, or worse, from lust. But the mind is most mercurial. So the clerics of Frigga start literally by putting their houses in order. This means keeping every campsite tidy. It means perfecting hygiene. It means to treat the sick and cultivate the land in ways amenable to Men. It means the faithful will build houses for the poor, and work as woodwrights, stonewrights, chefs. They build and civilize. And it means avoiding bloodshed when it’s possible, especially among the people of the common kinds – hence, why this Bluetooth uses Hold Person rather than flashier kinds of magic spells when he can. Frigga’s magic has kept this cleric, Bluetooth, and his health’s improved as well. Perhaps he’ll have a score of years to go before he meets with Hel. But not if Surtur hand his dark elf armies have their say. Tin Jin the Bandit King thanked the fellowship for their service in slaying the septarch and returning the golems' hearts to him. "Promised to you I did some token equal to your valor. Tin Jin deliver to you." They hadn't had a choice in the matter. Not really. It was fight the septarch or fight 299 wild and bloodthirsty bandits on their own turf. He pulled a red velvet sack from a foot locker and put it gingerly on the table. What could be inside? Bars of Platinum? 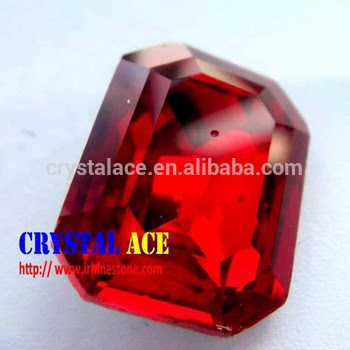 Rubies? Some strange potions? He carefully upended and emptied the bag. There on the table tumbled out four stones of glass, about the size of a bar of soap, with glyphs carved intricately on one side. There was one each in red, gold, green and blue. "Read the glyphs upon these stones. Venerate the ancients they named: Zagyg, Braunstein, Blackmoor and Og. They will give you a boon for as long as you carry them, but you must make the prayer each morning or the magic is lost to you for the day." The fellows each picked up a gem. They read the inscriptions solemnly aloud, and for a brief moment, each was surrounded by a dark force field that manifested with a sound like a bat's screech; then the force fields faded. "That's it?" Said Robert Bluetooth, with disappointment. "It only lasted but a moment." Tin Jin smiled with a twinkle in his eye. "The dweomercraft last all day. Invisible and waiting to turn away blades of foes." When venerated in the morning and carried on your person, this stone grants a 1 point deflection bonus to Armor Class and a 1 point bonus to all Saving Throws. It is as heavy as glass and fragile, so wise adventurers will wrap it in their bedrolls or similar for protection. "Tonight we feast. Three kinds meat! Tomorrow we hold joust: you put armor up against our fresh horses and supplies. Then you go and never come back to the realm of Bandit King." When your party finds a useful item in treasure, it is fun to describe it. But it's hard for most people to think of interesting adornments off the top of their head. If you are one of those people like I am, these tables can help. When you place or randomly generate an item, look at the category and roll d100. If the number has no material next to it, use the material above it. Use that material as inspiration for what kind of special feature or adornment that item has on it. Maybe the item is made from that material. maybe it has decorations in that material or is set with it. I left out wondrous items because their descriptions are pretty specific. There's also a list of all the materials I used to make up the lists in case you want to fiddle with them or make a list for something else, like statues or golems. The materials I used largely come from the old MMO Asheron's Call in case you're wondering. No you can't meet her. He drove you out of Ireland. For shame! Not a whole post. Just a few notes. Inspired by Becoming Orcish earlier in the week. Consider changing around other fantasy races just a little bit. Zombies are killed by salt. Regular folk beset by zombies can use fire and holy water of course, but salt dries them right out and ruins them. 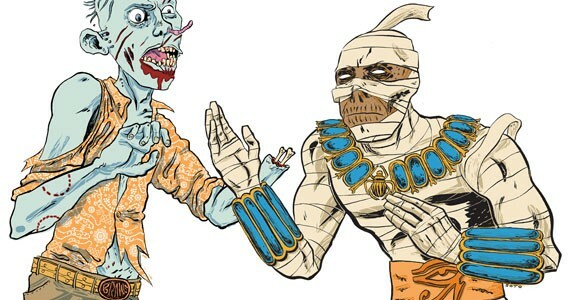 Likewise, mummies crumple like wet paper when they are drenched by clean water. Gnoles are the evil children of Gnomes and Trolls. They look like humanoid orangutans, live in trees, covet rubies, and like to eat wayward children. Kobolds are little blue humanoids who live in the walls of peoples' cottages. They wear clothes much like people do, except they're in shades of blue. They go to work and tend their kitchens just like people do. The men are expert miners and the women are expert cooks. If you treat them well they bring good fortune and if you treat them badly, they cause mischief. The little kobold men consider everything a complicated engineering and construction problem. They will always make the most complicated solutions to problems they can come up with. This is why dungeons are like mazes – kobold miners can’t seem to just dig straight for the ore. I know the theme and the premise and the A plot and the title of the next book and I'm going to start writing in earnest on April 1, but not all of the characters are showing up yet. It's like, I'm going to have to start writing before I find out who wants to be in the book. There's Eli of course, and the B plot is going to focus on Ellen and Gail and campus politics and a potential international incident. So those are set. I also have a main antagonist for the B plot based on Sepp Blatter or maybe an evil Poirot. There's a new sidekick whose name is Goldberg or maybe Epstein who is a Brooklyn kid who moved out to Arizona a while back and he's going to be a guide and a foil for the first part of the book and end up murdered. He's going to fill in some of the local color but also help navigate the court and prison system for the reader. But then I have this family of just really horrible crazy people and I'm drawing a total blank on them. I think they should all have really blond hair and eyebrows. And they're all just terribly damaged humans. I know some of the key plot points. But I don't know how to make the crime spree escalate. These are all the fighting rules I'm going to use in the Fallen Empire campaign. They fit on four pages, or five if you include the Jousting rules. Indoors or outside, it’s likely that your heroes will come to deadly combat with the odd men and monsters throughout the world. You can see the Attack Matrices on the front of the Referee’s Screen. These tables tell us how hard it is for someone to hit you and how hard it is to hit someone else in melee and missile combat. When your character dies in the game, don’t take it personally. You are not your character, and the Referee and his monsters are not your personal enemies (even though they are the enemies of the treasure hunters in their world.) Try to see your heroic adventures as chapters in the novel of that character’s life and remember them fondly. Then start a new story with a new character. Let’s examine the steps we go through in one Combat round. The Surprise Round: For the first Round of combat only, each side must check to see if it has surprised the other. Have each side throw 1d6. On a result of 5 or 6, they have achieved surprise. In this case, the other side may not act in the first Round of melee. It is possible for both sides to be Surprised at once! During the Surprise Round, the side which has surprised the other gains a +1 To-Hit. This bonus does “stack” with other To-Hit bonuses. Each side checks morale, if appropriate. 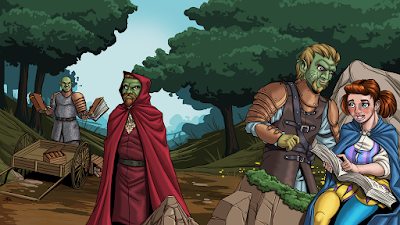 First the monsters, then the Henchmen of the Player-Characters and other NPCs on the side of the good guys. Check Morale for either side first when one side or the other has their first casualty, and then again when half of that side or more has been defeated. If the side passes both Morale checks, they will fight until death. Otherwise someone will surrender or try to run away. Once combat begins, each person and then the monsters declare what kind of action they intend. The kinds of actions are full movement, make a missile attack, cast a magic spell, make a melee attack, and “other” which includes anything else. Each side rolls 1d6 for Initiative. The side that rolls higher gets to make their actions first. In the case of a tie, everybody does everything simultaneously. Movement happens. Characters and monsters can move 1/3 of their base movement in scale inches for free. Moving farther than that precludes taking any other actions that Round. Ranged Attacks happen. Anyone with a sling or a bow fires off their weapon. In the case of hitting an enemy Magic-User, their spell is ruined! Melee Attacks happen. Anyone attacking with a sword or mace, for instance, makes their attack now. Magic Spells are cast. Again, if you are going second or there is a tie in the Initiative that Round, and you are hit with a missile weapon, your spell has been ruined and is lost from your mind. Miscellaneous Actions happen. Maybe you want to drink a potion, use a magic wand, or push over a table as a barricade. These actions happen last. Repeat for the side that lost Initiative. Go back to #1 and see what happens next! The Opportunity Attack: Should a combatant currently engaged in melee attempt a Full Retreat or if a character moves right past you (including on a Charge), you get to have one “free” attack out of turn. If this attack succeeds at dealing at least one Hit Point of damage, the moving combatant must stop moving. Only one such Opportunity Attack may be attempted per combatant per Round. Tactical Movement: Clever players and monsters won’t simply stand toe-to-toe beating each other’s brains out, but will rather make movements within combat- advances, withdrawals, and even full retreats when the time is right! 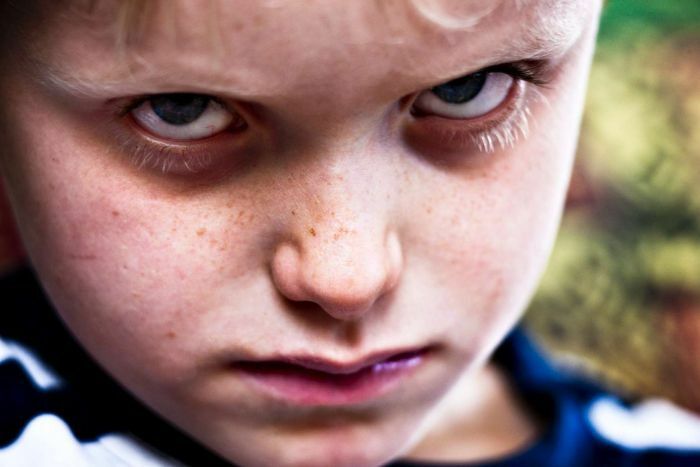 Fighting Withdrawal: A Fighting Withdrawal is the only safe way to leave a place that is threatened by an opponent. When a character withdraws, he backs carefully away from his opponent without turning his back or creating an attack of opportunity for his opponent. Withdrawing is a move that takes place at the beginning of the Round. A withdrawing character cannot attack or cast spells, although he can still make opportunity attacks. He does not attack, but moves backwards up to one-third speed (usually 4” or less) and retains his full Armor Class. Full Retreat: Any melee combatant may attempt a Full Retreat. He moves away from melee at full speed (usually 12” or less). His opponent(s) get a free attack out of turn against him and the character does not receive the benefit of his Shield or DEX bonus to AC. If any attack deals damage to him, the Retreat is negated and the retreater is stuck in combat for another Round! The exception to this free-attack rule is if an ally moves into melee with the same opponent(s) to cover the retreat. The Charge: A "Charge" is a melee action in which your character moves as fast as possible, planning to use a weapon at a point of impact, benefitting by the force added due to momentum. A PC or other character can "Charge" anywhere as long as he expends at least half his base full move in the process, and only if he is holding and using a melee weapon. A Charging character is +2 to hit, but -2 Armor Classes. If your man’s “Charge” hits, the damage inflicted is double normal; throw twice the normal number of dice, and then apply bonuses (strength, magic, etc.). Charging creatures must have suitable weapons: a skirmish weapon or large horns or tusks. A monster without such weaponry doesn't have the ability to charge. Setting the Spear: If a PC or another character is aware of an opponent using the “Charge” maneuver against him and is acting first in a Round, He can use a tricky maneuver to stop the Charge: he can “set” a spear or pole arm against the charge by bracing it with his foot or against some heavy object. On a successful hit, he deals double damage and negates the attack at the end of the Charge. Only Fighting-Men, Men-At-Arms and Demi-Men are able to “set” a spear in this way. Rear Attacks: Melee attacks to the rear of the target (aside from being dishonorable), gain a +2 to hit, and the defender does not get the AC benefit from his shield if he uses one. Cover: Should a character in missile fire combat find his mark behind cover of some kind, throw 1d6 after determining a hit. A throw of 1-3 means the attack hit the cover instead. Of course, characters may “cover” one another, like a Secret Service man taking a hit for the President. Firing into Melee: A missile shot into melee that is scored a hit has an equal chance to hit any character engaged in that instance of melee, even the attacker’s allies. So be careful! Henchmen and Retainers will never fire into a melee, for fear of hitting their bosses. Mounted Combat: Mounted cavalrymen and knights gain a +2 to hit and a +2 to damage over combatants on foot. Lances have an extra 10’ reach as well, which makes it likely that cavalrymen automatically gain initiative if he uses one. One the other hand, shooting a bow from horseback imparts a -1 penalty to hit, and only Shortbows can be used from horseback anyway. Surrounding Individual Combatants: If you and your party want to surround an enemy, up to six Men may encircle a Man-sized opponent. Up to eight Men may encircle a larger opponent. Fighting requires 5’ of frontage per man in any case, unless in tight formation. If a single target is at least halfway surrounded, the majority attackers get a +1 to hit. Shields Shall be Splintered! : You get the usual -1 to your AC with a shield. However, any time you take damage, you can opt instead to say your shield absorbed the force of the blow. The shield is shattered and must be discarded, but you don't take any damage from that hit. It's quick, it's easy, and it's valuable. Magic shields can be given up once per day without shattering, but then they are considered nonmagical for the rest of the day. If you give it up again, it is shattered permanently. Shields made from the heartwood of the rowan tree (which is sacred to the Elves) can be given up to avoid one magic effect, even one that deals no damage or one that offers no Save. Shieldmate: A Fighting-Man or Demi-Man using a shield and standing next to another character also provides their shield bonus to AC to that character. Therefore two Fighting-Men with shields, for instance, standing side by side, grant each other an additional -1 AC. Subdual Damage: Attacks made with the “flat of the blade” for non-lethal damage suffer a -2 attack penalty. Many weapons can be used this way. If a character or monster reduced to zero Hit Points has taken at least some subdual damage, the he becomes unconscious rather than dead. A character knocked out in this way but not subsequently killed will wake up with 1-3 hit points in 1-3 Turns, or can be awakened by someone else after 1 Turn. This is one way to force a monster to serve you if you want. Hit Points: No one can say exactly what a Hit Point is. They are an abstract scale with “completely unharmed” at one end and “dead” at the other end. Poisons, Toxins, Venoms: Not all poisons kill you instantly. Not all poisons kill you outright at all. These can have varied effects over relatively long periods of time. “Save versus Poison” is not an instant death sentence, but it usually serious. Natural Healing Rates: 1 Hit Point is healed each night on the trail. 1d3 Hit Points is healed per night of good bed rest back in town. Bandages: “Bandages” is a catch-all for first aid supplies. Applying Bandages takes one Round (1 Minute) and heals 1 hit point. For characters under 0 hit points, Bandages will stabilize their condition. After you use one supply of Bandages, roll 1d6. On a 1, that Bandages is expended. Character Death: When characters reach zero Hit Points, they are hovering on the brink of consciousness, about to breathe their last. They cannot move, and only have a vague idea of what’s going on around them. From -1 to -10 hits, you're on the edge of consciousness, unable to act. You can crawl 10 feet if the situation allows it. At The End Of Each Round (1 minute Round) you Save or Die. If you miss it, you're dead. But conceivably you can hang on for a long time. After this check, see what else happens. You will be stabilized by someone if they apply Bandages or healing magic. This takes 1 Round. If you are stable, you cannot fight or cast spells, but you can move with the group. You can apply your own Bandages or drink a potion if you make a CON check to stay awake and focused enough. This raises you to 0 HP and you don't need to make any more checks. It will not cure poison or something if that's what nearly killed you. Your New Character: You can roll up a new one like we did at the beginning or you can promote one of your own Retainers or Men-At-Arms. Remember the “Squander” Rule can advance your new character by quite a bit, if you decided to sock away any extra XP that way. Jousting Contests: Jousting is more sport than battle, and is conducted most commonly between Fighting-Men, although anyone who can wear Plate armor and carry shield and lance should be able to try it out. Blue-bloods shall often call jousts and offer as a prize some amount of money. The greater the noble who calls the joust, the more prestige to the winner, and the more knights who will come. “Official” jousts are called at many times outside of wartime, but usually during another festival or holy day. Fighters sometimes settle contests of skill or insults real or imagined over a joust. They can be for fun or very serious, but no one is meant to actually be injured. The host calls upon any number of participants from far and wide. The host himself will compete if he can. Jousts with many entrants are called Lists, and may proceed either by Swiss rounds or single-elimination at the decision of the host. Lawful hosts usually offer the first method while Chaotic hosts will usually offer the latter. In a round of jousting, mounted horsemen take three rides at one another with the intent of knocking off the helm or unhorsing the other fellow. Scoring aside from these two outcomes is arcane, and for the most part, neither rider will lose his helm or his horse. If the adventuring party in the Wilderlands comes upon the castle of a black knight, that knight may challenge one of the characters to a joust. If the black knight wins, he will take that character’s horse and armor! If the PC wins, the whole party gets to stay at the castle, rest up, and get fresh horses when they depart. The Joust’s Game Rules: Each combatant has a Dice Pool with 1d6 for each hit die or fraction he has. Each player secretly chooses to throw one to three dice and hides the number from the other combatant. If one player has chosen to throw fewer dice than his opponent, then ties count as victories to him (and defeats to the majority holder.) At the signal, each throws his dice. Match up each player’s highest-scoring die with the other’s highest die, then the second-highest, and so on. Each die throw lost subtracts a die from the loser’s Dice Pool. Dice without a mate are not counted. A player may only throw as many dice as are remaining in his Dice Pool or a maximum of three in any case. Should he be all out of dice, he has lost for the whole round. A round of jousting continues until one or both jousters are out of dice to throw. The player whose character has the largest remaining Dice Pool is the winner. Differences in experience Level of 1-2 can sometimes be overcome by a canny player with hot dice, but the higher-Level combatant enjoys a strong advantage in any joust. Unhorsing and Helm Tipping: Should a player throw three dice and the three dice all come up the same number (all 5’s for instance), the opponent is unhorsed, the round ends, and that player is the winner. This is the rule for any triple thrown except for triple 1’s. Should both players unhorse each other, score the round normally. Alternately, the Referee may say that the helm is tipped off rather than the rider being unhorsed. Injuring the Opponent: If a player throws all 1’s on one, two or three dice, he has injured his opponent! Whether it has happened accidentally or through underhanded tactics, this is considered quite dishonorable. The injured knight then takes as many dice of real damage as the other player’s knight had thrown and is out of the tournament to recover. The dishonored knight is ejected from the tournament immediately. In such a case, it is customary for the injuring party and the host of the tournament to split the cost of nursing the injured knight back to health. Orcs are not a race. Orcishness is an affliction that will sometimes happen to groups of people. It spreads like a strange disease, but many of its sufferers do not care to be cured. Your stats are set to S 16, I 5, W 5, D No Change, Co 16, Ch 5. So if you depend on mental stats, you're doomed. How to become Orcish: Spend a week with a community of Orcish people. After the week, Save vs. Poison. If you fail, you will start to become Orcish. You cannot choose to automatically fail this Save. You will become quite strong and vigorous, then slow and stupid, then turn greenish and your teeth will protrude. You will forget your old personality and prefer orcishness in most cases. How to stop being Orcish: Spend 70 GPs per character level and live for one month with a religious order. They will lock you up and cure you, much in the same manner as they could cure someone suffering from lycanthropy. Alternately, allow an apothecary and four strong men to heal you over the course of the month - it does not require clerical magic per se. Rates and success vary. Should Magic Rings Be More Awesome? Gary himself was too hip for Lord of the Rings. He made his magic swords AWESOME and his magic rings cool, but not overly cool. But you look at the One Ring... it had some major powers going on. It functioned as a Ring of Humanoid Control over the bearers of the other rings... which were themselves Rings of Humanoid Control. It functioned as a Ring of Invisibility, with the drawback of Inescapable Location for Sauron. And it had that Ego battle thing going on. Who was in charge? Also, anyone who wasn't a Hobbit was prone to going ape and doing whatever it took to keep it for himself. That's a lot to unpack, isn't it? 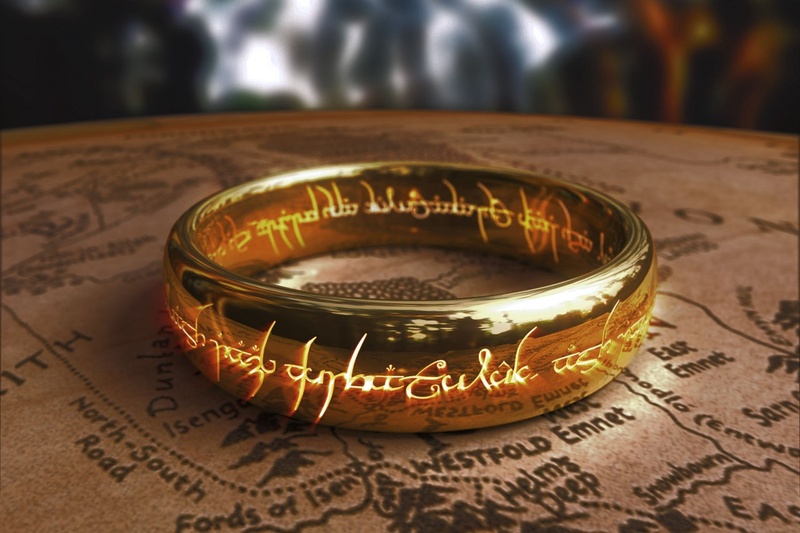 Granted, THAT Ring is an artifact and the rings your dudes are likely to find are less magical. But should they have the capability to be as awesome as magic swords are? And there is no gameable content in this post. I'm just telling you that your magic rings are lame and they could be cooler and would you go fix that please. That's all. TPKs make good stories, if done sparingly. I'm not sure to whom I should attribute this observation, but it seems true: the less time you spend making up a guy, the more willing you and the Referee will be to let him die. The death rules in later editions are just silly! But the "death at 0 HP" rule is just too harsh for me at this very moment. Maybe tomorrow I'll feel particularly nihilistic and kill dudes at 2 HP or something. But for today I'm looking at something more forgiving. Here's why: I want my players to feel comfortable being heroic and taking risks when it's warranted. So here's a suggestion I'm going to make to myself about how to handle death in my Fallen Empire game. From -1 to -10, you're on the edge of consciousness, unable to act. You can crawl 10 feet if the situation allows it. What do you think? Is this too generous?